Do You Know the Active Shooter Response of Your Child’s School? 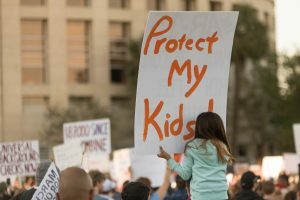 The desire to protect our children at school is universal. The solutions and counter efforts to school shootings are where people differ. Do you have children who go to school? Do you know the protocol that the school uses in response to an active shooter incident? Are there armed teachers/security at the school? If so, what is their training requirement? Is there a police resource officer there? If so, during what times of the day? Is it simply a shelter in place response? If so, are there any additional resources the teachers can use? Do the doors simply have locks, or does each room have a door barricade device? Do the teachers have access to less-lethal options? If so, where are they located? Is there a perimeter fence? Are all doors locked and only opened to authorized persons? I grew up in Ohio so along with fire drills, we ran tornado drills. Some states may also have earthquake drills, or bomb drills. Much has gone into studying the best response to these types of incidents, so we have long-established procedures that have all but eliminated school deaths during these incidents. We take for granted our child's school will have a plan in place, and there will be routine evaluation drills of staff and students. But with the school shooter phenomenon, the country cannot get past differing ideology in order to come to the same logical solutions we see in responses to events like fires or earthquakes. Active shooters in schools may seem like an epidemic. While every mass shooting is a horrific tragedy, they are rare. And school shootings, even more so. That does not mean they are not a serious problem that requires a serious solution. In response, some school systems have implemented different training programs, designed and instructed by local law enforcement agencies. Others allow select teachers/staff to concealed carry. Based on some best practices that have been identified by analyzing previous school shooting events, schools have enacted their own protocols. Again, do you know what the policy is for the school your child goes to? When deciding on a school, the active shooter response plan was a question I asked of each principal. And while my daughter's small, pre-K through 5th-grade school does not have the most ideal plan in place, it does implement several good strategies. And more importantly, seems open to various options. The other day I noticed something I had never seen before. On a hallway wall at my daughter's school was what looked like a fire extinguisher. It's a system called the “Threat Extinguisher,” as you can see in the picture I took. 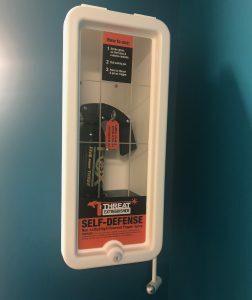 Is the threat extinguisher the fix to stop school shooters? a powerful combination of panic system and a proven effective defense option. 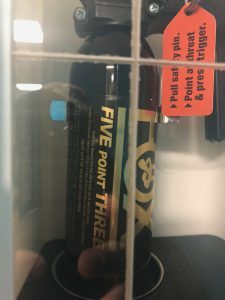 A box with a breakable glass front houses a FOX Labs 5.3 OC spray can. This particular OC or Oleoresin Capsicum is rated at 5.3 million Scoville heat units (SHU's) and 35% major capsaicinoids. Those of you not too familiar with OC ratings can check out this article I wrote a while back. But let's say, as OC spray goes, this is about as hot as you're going to get for human application. The bottle holds one pound of the OC liquid and is designed to spray in a stream up to 20′. If the canister is removed from the base, an audible siren is sounded. This also triggers text messages to be sent out to staff/parents, and local Law Enforcement is notified. The bases are programmed much like a security system so that each unit has a special zone that it is assigned. When activated, responders will know which zone has been activated. The systems are not cheap and there is a monthly fee to keep the text/connectivity feature active. On the site, there are a few links to news articles describing the device and how it works. Everyone involved, from designing to purchasing and installing the systems have their hearts in the right place. They want to do something to make schools safer and that is truly commendable. I am sincerely grateful that our school was willing to move forward and purchase these devices. The FOX Labs OC spray in this unit is extremely hot, and removal of the device activates a siren. Sounds Great, But is it Practical? A panacea is defined as a solution for all difficulties. Think of the person who has stomach pain, and instead of going to the doctor, uses natural herbs that are supposedly going to cure their stomach issue. They end up dying, because the herbs are great for dealing with excessive gas, but not the stomach cancer that was actually causing the pain. The person believes they are safe when in actuality they are not. This is one of my concerns with this device and is evident in the news reporting on this system. The device is described almost like a magic talisman, or something that merely having in your possession will protect you from all harm. It just doesn't work that way. One of the teachers interviewed stated that they wanted a non-lethal response to an event like an active shooter. I'm sorry, but in the event that there is an active shooter taking innocent lives, the priority is saving those being gunned down, not trying to save the life of the one bent on murdering as many people as possible. There is nothing ethical or benevolent about allowing someone to continue killing innocent people out of fear that the evil-doer may have to be killed. It is difficult (not impossible) to continue an attack if your eyes are watery, swollen, and blurry. And this can only happen if the OC oil can get into the eyes. And it can be more difficult to achieve that outcome than one may think. OC does burn the skin, but that is just an irritant and is not going to stop an attacker. So unless you can catch the attacker off-guard, effective deployment of the spray into the attacker's eyes is going to be difficult. Especially if they are armed with a firearm. Even in a narrow stream form, cross-contamination is a huge drawback of OC. This is especially true if it is going to be used around young children. Children suffering even mild effects of OC spray might not be able to run, hide, fight, escape, etc. First responders may also suffer the effects of cross-contamination if entering an area of high OC concentration, delaying response times. An armed response that is already on the scene is the fastest way to interrupt an active shooter's plan. These devices are relatively expensive, so it not feasible for most schools to have one inside each classroom, which would be ideal. So they will likely be strategically mounted in a few hallways. Therein lies a tactical and practical problem. Upon hearing gunshots, is the teacher/staff member expected to unlock the classroom door, run out into the hallway where the shooter might possibly be, and retrieve the OC can? This requires the staff to leave a well-barricaded area and allow access to unattended children. Not a good plan. How about if one teacher retrieves the spray, what is their role and response? Do they retreat back to their classroom, denying others from having the only allowable defensive weapon, or do they become the person responsible to delay the attacker until LE can ultimately stop the attacker? I know there are other improvised tools that can be used as defensive weapons. But if they were ideal, they would be hanging a bat or bucket of rocks on the wall instead of a can of OC spray. While the device immediately sends out text message alerts, that may not be the best plan. Strategically, if there is an active shooter, and parents are notified at the same time as responding LE, you could have a scene that is difficult to manage and would potentially place additional people in harm's way. A generic message will not have information such as where to stage and meet LE and school liaisons and possible areas to avoid. As hard as it is, these incidents can become even more tragic if access to the scene is not controlled. So it's a Total Bust? Given the drawbacks still, I believe these systems have value. First, it gives staff or students of proper age a tool to fight back, even if it is not the ideal tool. This changes their paradigm on the role they play in their own survival. They shift from becoming helpless sheep, to people with the mindset to fight back. Not only a mindset, but the confidence to know that they can fight back and need to. That mindset can be what tips the scale. The final outcome of Flight 93 on 9/11 is proof of this. But in order for them to be effective, staff and students of the proper age should receive training. Installing these devices requires training on its use. This may cause schools with no protocol, or outdated procedures to revamp their entire response. Additionally, training forces staff to face the reality that they are undoubtedly the first responders during the initial, most critical stages of an active shooting event. This sobering reality may force them to see their strengths, and where they need to be better in their role as a line of defense. Let's face it, like it or not, teachers are responsible for much more than teaching our children reading, writing, and arithmetic. The same way we expect teachers to be able to respond appropriately to protect children during a fire, if one of these events happens, they must be prepared. 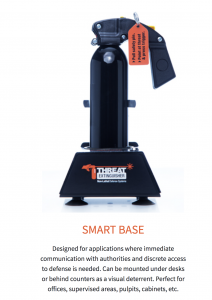 The Threat extinguisher has some great features, but it should be used as just a part of a comprehensive active shooter response protocol. After installing one of these devices, and learning of its limitations, a sense that something more is actually necessary will be evident. It may open the eyes of more teachers/staff that OC spray vs a firearm is a tough hand to be dealt. They may better understand the need for armed security, resource officers, or teachers who have been trained and conceal carry as a necessary safeguard. No parent, whether pro or anti-gun, wants any child to be harmed at school. We circumvent meaningful dialog and actual solutions when we lose site of that fact, and focus instead on ideological differences, or attack their intentions as sinister. I would like to offer a sincere thank you to Sam Fisone, who invented this device for having his heart in the right place. 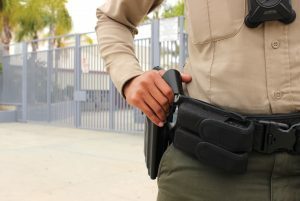 No matter what one's feeling about the effectiveness of the device, Fisone is actually proposing something that can be one piece of a comprehensive and effective active shooter response protocol. Also a thanks to the superintendent of my daughter's school and others that take security seriously and are willing to take a look at options other than calling for gun bans. So if you don't know your school's response, now is the time to schedule a meeting. If your school is not making efforts to better their security posture, then they are becoming more and more vulnerable. Perhaps a sincere conversation with several parents will force a committee to be formed. A committee that can look at the pros and cons, as well as the practicality of other options that will better safeguard our most valuable treasures. How is your child's school equipped to handle an active shooting event? Would you want your school to be outfitted with a Threat Extinguisher or similar device? Let us know in the comments below.